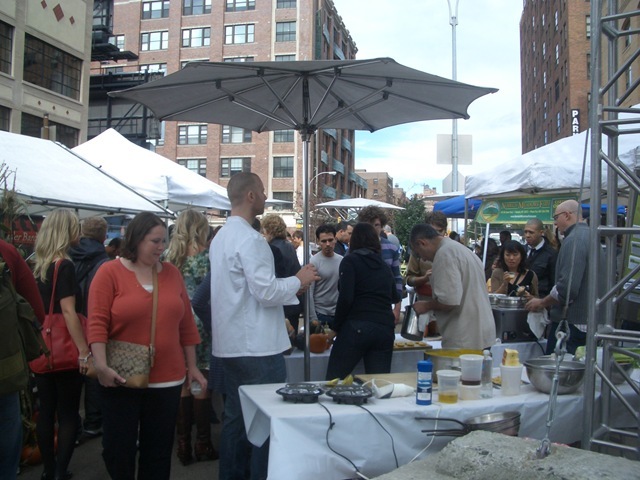 This Saturday I visited the Basis Good Food Market, which is opening this winter in the Meatpacking District. 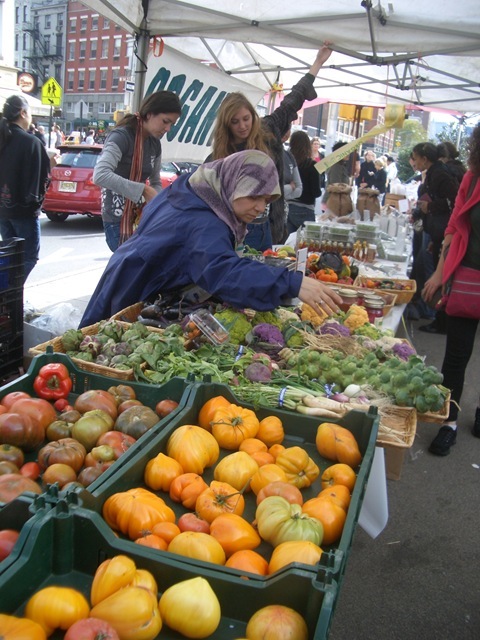 The event featured fresh food from local producers at affordable prices. Local venders sold everything from seasonal produce, top-notch artisanal dairy, cheese and meat. Moreover, the famous Rouge Tomate restaurant Chef Jeremy Bearman and team were dishing up some of the season’s tastiest selections using ingredients from the participating farmers. The weather was perfect and it was an ideal autumn day filled with apples, kale, yogurt, cider, baked goods and whole grains. Basis is a mission-driven company committed to good food for everyone; they are passionate about local, traceable and clean food. 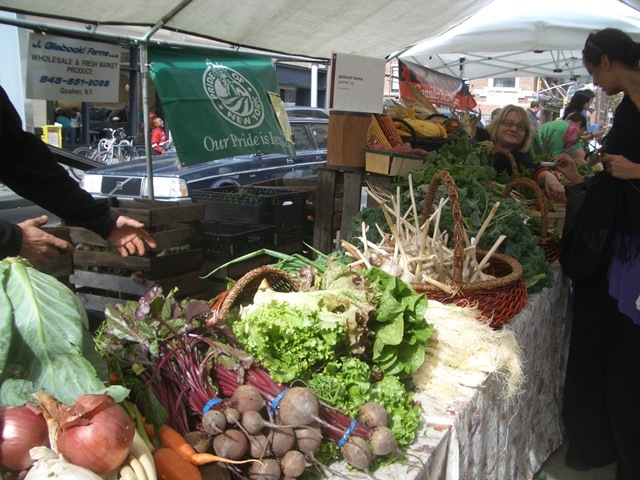 Basis partners with local communities and farmers to sell goods at affordable prices. This winter, Basis will be launching a new chain of small retail food stores that will sell delicious, local fare from trustworthy producers. 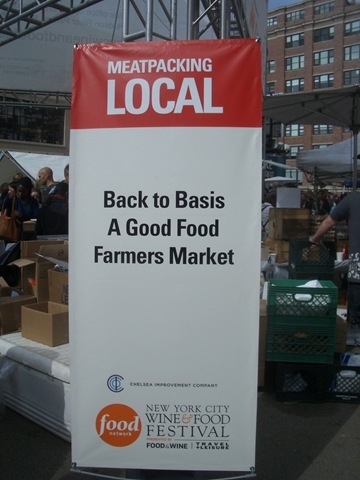 Moreover, Basis offers storage, marketing services and delivery for farmers interested in selling their products directly to wholesale customers, including over 20,000 restaurants in New York City. You can visit the Basis website to learn more about this wonderful business that will open this winter right here in the Big Apple. At the market I was surprised to see my favorite new yogurt brand, Siggi’s. 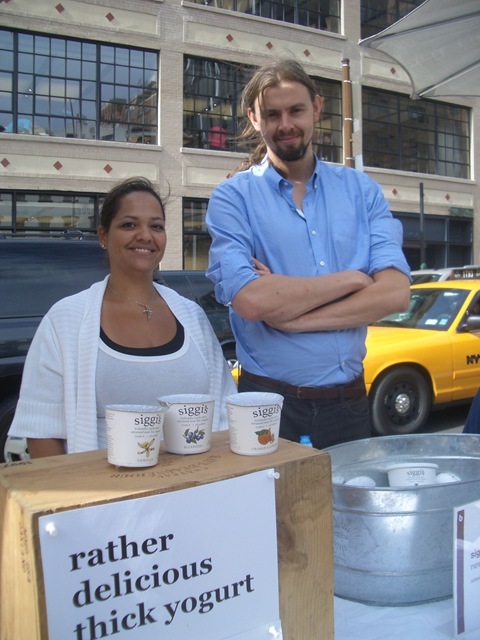 I met Siggi and his Operations Manager, Isabel, who were kind enough to give me a free Siggi’s Plain yogurt- Yum! Back in April, I contacted Siggi regarding my love for his delicious Icelandic yogurt and he was kind enough to send me Siggi’s gift certificates for my clients and myself. Here is a picture of the famous Siggi, himself and Isabel. 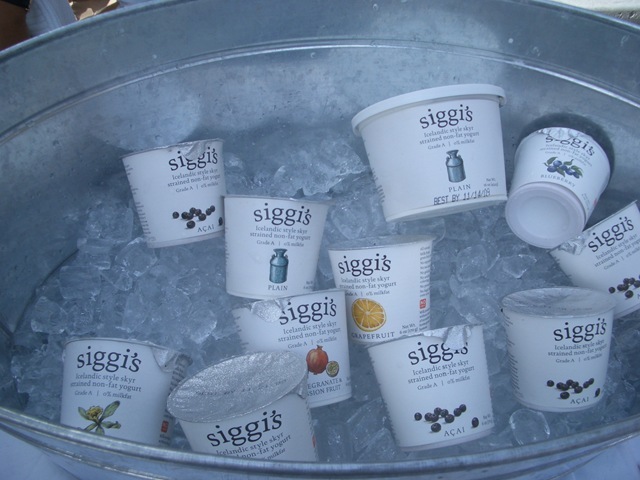 Have you ever tried Siggi’s yogurt? It’s incredibly thick and has a unique taste, quite similar to sour cream…which makes it a perfect replacement for the typical high sodium, high fat, highly processed sour cream. I will be writing a product review for Siggi’s Icelandic yogurt soon, so be sure to stay tuned. Siggi’s yogurt is sold in Whole Foods, Food Emporium and the Grand Central Market here in Manhattan- I’m sure it’s sold in many more outlets, (you can find out where to purchase Siggi’s in your area here) however, these are the locations in which I purchase my Siggi’s. I just love the Siggi’s packaging. Each yogurt is packaged do perfectly and delicately…the labels are quite eye-catching and each flavor has an adorable image that makes me want to try them all. Be sure to take a look at the Siggi’s website for their tasty line of Icelandic yogurts and be sure to pick one up at your local market. Let me know what you think as it’s my new ‘fridge’ staple for breakfast, lunch, dinner, snacks and desserts. I’ll be sharing numerous of my newly created Siggi’s recipes with you when I post my Siggi’s yogurt review—soon to come! I told Siggi that I’ve been busy recipe testing with his yogurts in my tiny Manhattan kitchen—soon you’ll be able to access a unique batch of my recipes on Siggi’s website. Overall, I had an amazing afternoon visiting the Basis Market and I cannot wait for their store opening this winter…I will surely be visiting there every weekend. Their motto, ‘Good Food For All’ is right on target—it sure is good, local, traditional food and aligns well with my Healthy Apple clean eating philosophy. Hey there I came across this post by chance, I was surfing around Google for Goji Berry free trial when I came upon your blog, I must say your site is very interesting I just love the content, its astounding! I’m strapped for time right now to entirely absorb your blog but I have saved the location of it and also subscribed for your RSS feeds. I will be back in a day or two. Thank you for a great site. Thank you so very much for your comment; I greatly appreciate your kind words and I am thrilled to hear you are enjoying my blog! Welcome to The Healthy Apple…please feel free to contact me with any questions you may have. I look forward to reading your Goji Berry blog. Have an enjoyable day and thank you, again! Happy New Year! Hi. Really solid data on Maqui Berry. I discovered your nice blog while researching bing. For the previous few days I’ve been seeking to learn more. Specially anything to do with the diet talk. I’ve seen it all and my best friend keeps pressing her recent weight loss craze on me. So I am grateful I encountered you. All the best! Just found this blog as well! Love it. 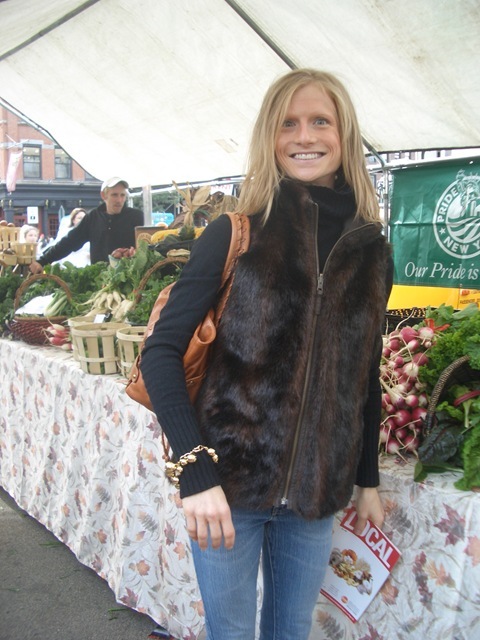 And love that Farmers Market. You’re so lucky to have that. Did you buy some yummy food? Hey, cool website. I actually came across this on Yahoo, and I am happy I did. I will definately be coming back here more often. Wish I could add to the conversation and bring a bit more to the table, but am just taking in as much info as I can at the moment.